You don't have to have two pointy sticks to knit some really neat projects that will keep you cozy from head to toe. I set my knitting needles aside for a few days so I could work with the Clover Standing Oval Knitting Loom. 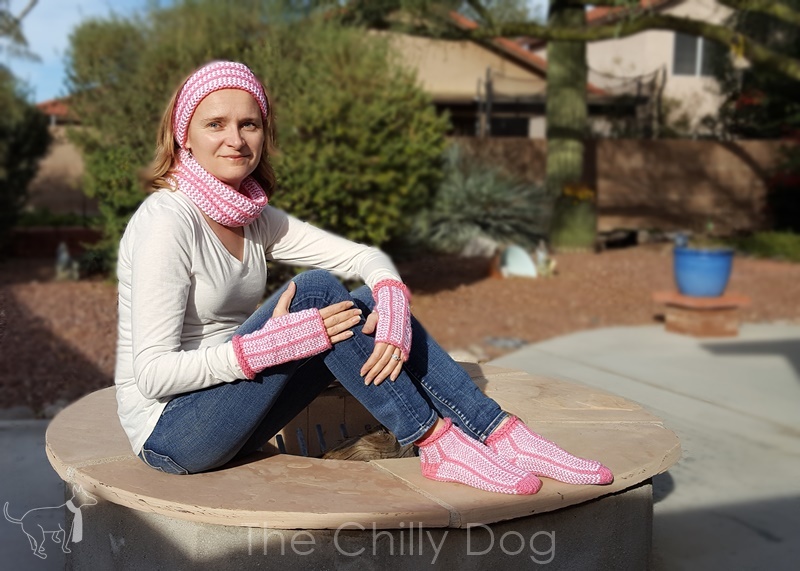 Earlier this week I showed you how to make a striped earwarmer and I have three more coordinating patterns to share - a cowl, fingerless mitts and socks. 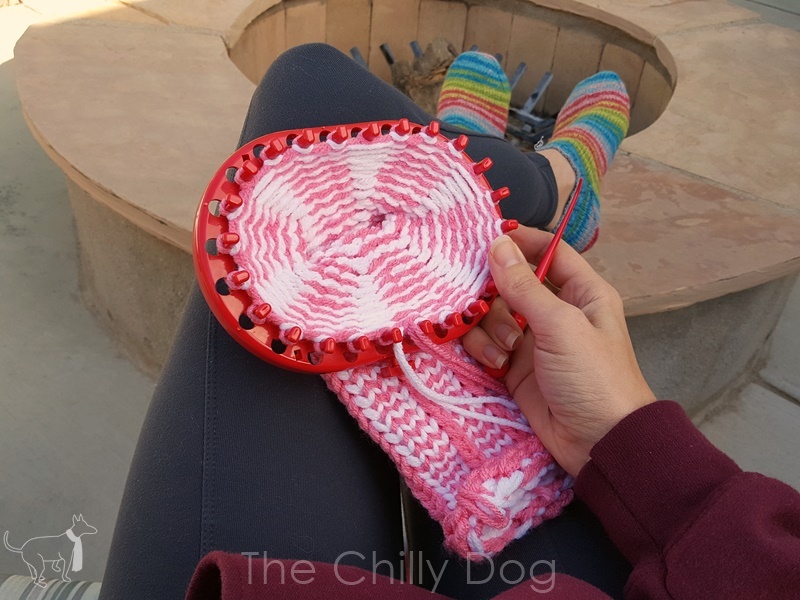 Although none of the projects are difficult, I recommend working them from head to toe, because each pattern introduces skills you will use in the following projects. 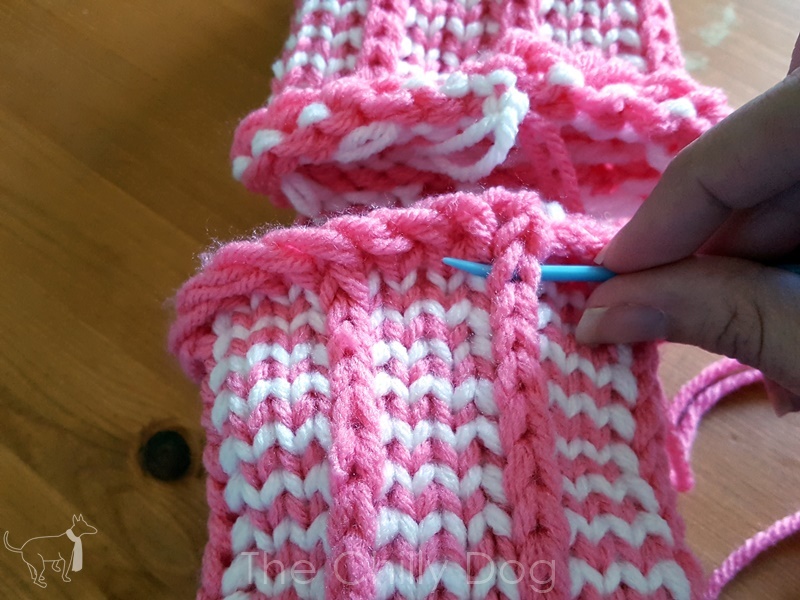 If you liked the earwarmer pattern you are going to love the matching cowl because it is worked almost identically except instead of using single strands of Bubble Gum and White Yarn, you will use double strands. Split each skein of yarn into two balls that are approximately the same size. 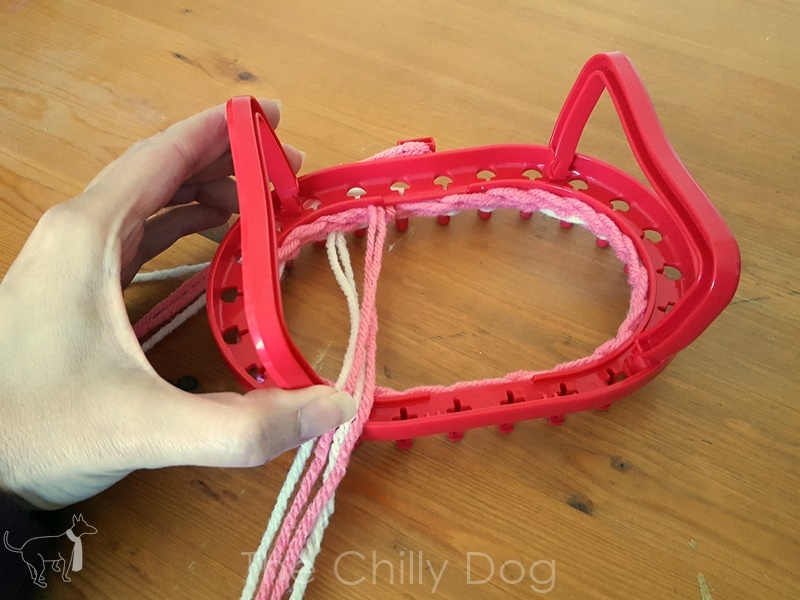 The loom comes with a straw that you can cut in half and use to hold the two strands of pink and two strands of white yarn together as you work. Row 2: With the White yarn, skip the first peg, knit on the next three pegs. Skip 1 peg by bringing the working yarn behind the peg, knit on the next 3 pegs. 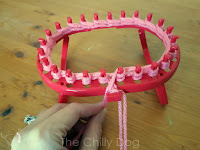 Repeat this pattern around the rest of the loom - skip one peg, knit on 3 pegs. 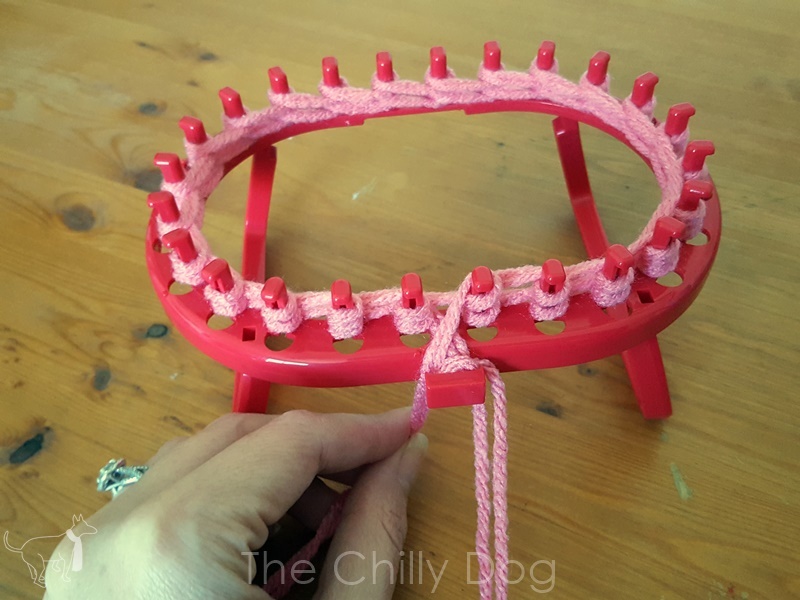 After the first two rows, I found it easier to remove the legs of the loom by gently squeezing them together near the loom and work with the loom on my lap. Row 3: With Bubble Gum, knit around all of the pegs. 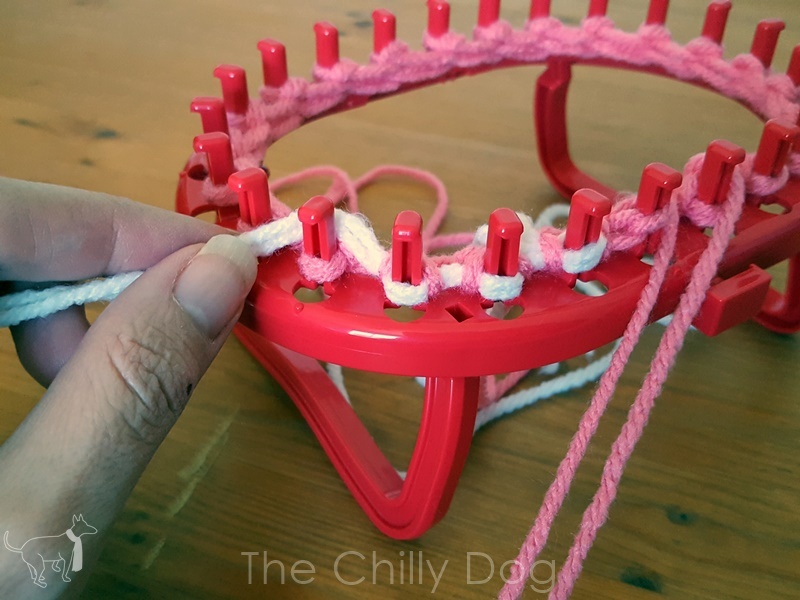 Row 4: With White, [skip one peg by bringing the working yarn behind the peg, knit on the next 3 pegs], repeated the bracketed section around the loom. Repeat Row 3 and 4. As you continue repeating Row 3 and 4 the work kind of looks like a spider web. Now, you need to figure out how many rows long your cowl should be. 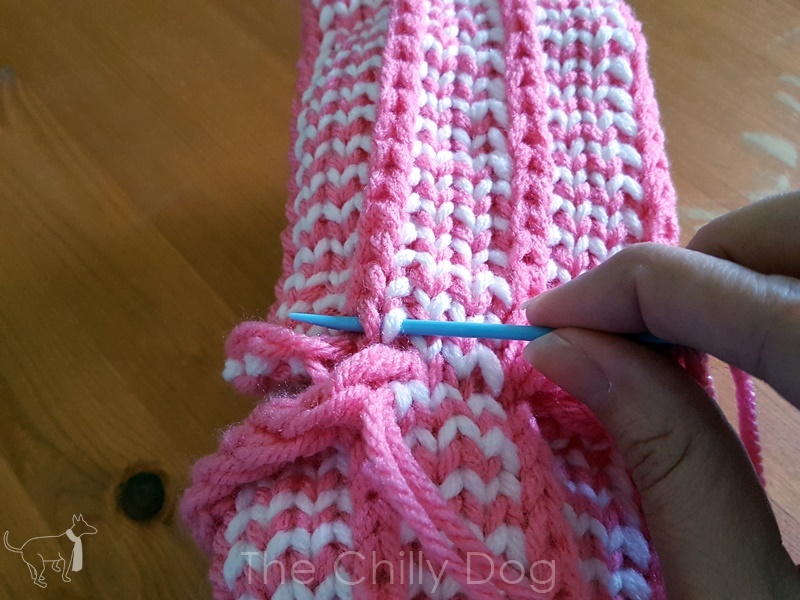 The quick and easy method for calculating this is to make the cowl the exact same number of rows that you made your earwarmer. My earwarmer was 126 rows long so I made my cowl 126 rows long. Since you are using double strands of yarn, the cowl will be a little bit bigger than your earwarmer. If you prefer to do the math, there are three easy math equations to make sure your cowl fits perfectly. Continue working Row 3 and 4 until the piece is about 12 inches long. First, measure your head circumference with a tape measure. My head circumference was 21 1/2 inches. Next you need to figure out your stitch gauge. You can do this one of two ways. Either count how many "V" shaped stitches are in one inch (for my example it looked like there were about are 5 3/4 stitches in an inch) or count how many "V" shaped stitches there are in four inches, for my example it was 23. It's good to do both row counts so you can double check yourself. Then, you need to calculate the Gauge, or how many rows are in 1 inch. When I counted, I estimated 5 3/4 rows in one inch and counted 23 rows in 4 inches. Let's make sure my estimate is right. Next you need to decide how long your cowl needs to be. The finished cowl should be about an inch larger than your head circumference. Finally, you need to figure out how many rows long to make your cowl. Of course you can't really knit 3/8 of a row, so round to the nearest even number, in this case 130 rows. As I said before, I cheated on the math and just made my cowl 126 rows long like my ear warmer. 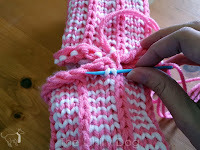 Continue working Row 3 and 4 until your cowl is the correct number of rows long. Make sure you end after a White row. Cut the White yarn 6-8 inches long. Cut the Bubble Gum yarn so it is about 120 inches or 10 feet long. You will use this yarn both to bind off your work and to graft the two ends together. 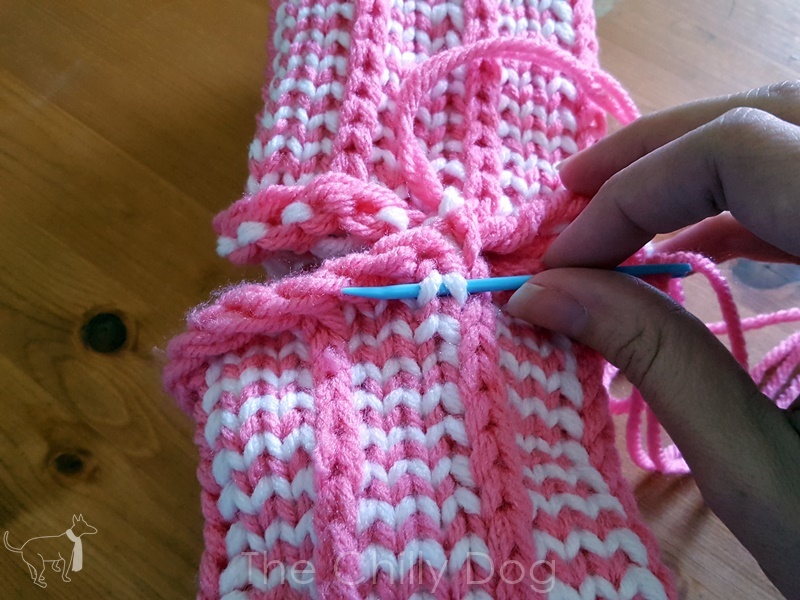 Follow the directions provided with the loom for a “Sewn Bind Off”. 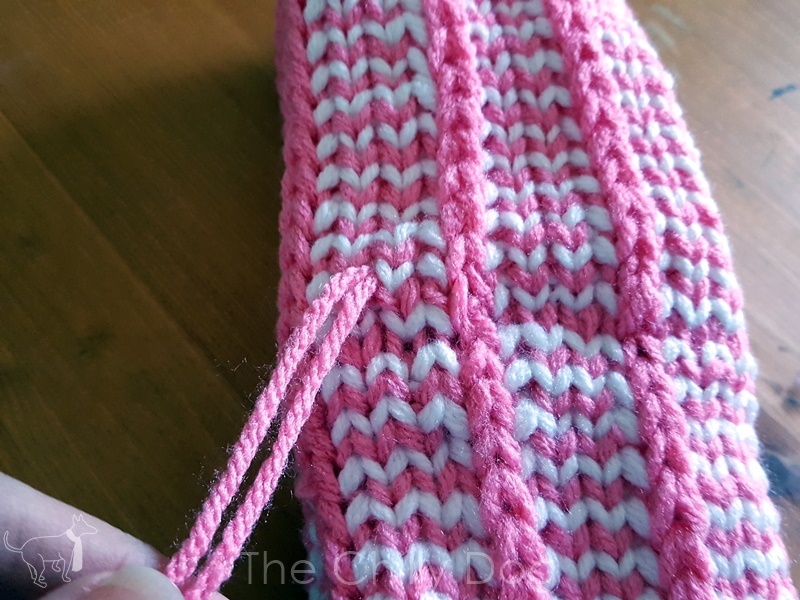 To make sure that your cowl is not overly bulky where it is grafted together, I highly recommend following the loom instructions for “Tightening and Finishing Edges”. 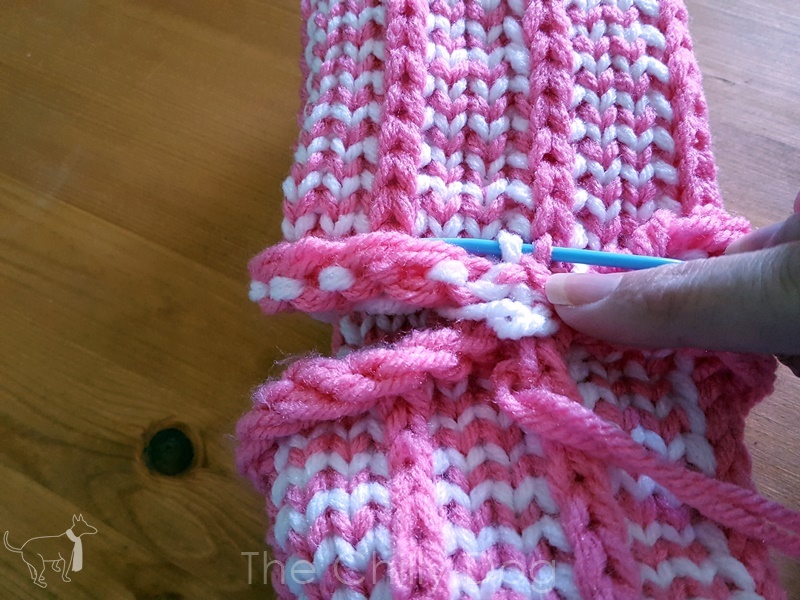 After both the cast on and bound off edges are tightened, knot the white yarn around the Bubble Gum on each end of the cowl. To finish things up, you need to graft the ends of the cowl together. 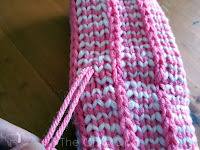 When grafting, you're going to focus on the stitches that make a "V" that points towards the seam. You will be working mainly in the rows of White stitches closest to the cast on and bound off edges. Place your darning needle on the same strands of yarn that were used to bind off. All the other loose yarn strands can be trimmed to 6-8 inches and tucked inside the ends of the cowl. Fold the cowl in half so the cast on and bound off edges are close to each other. 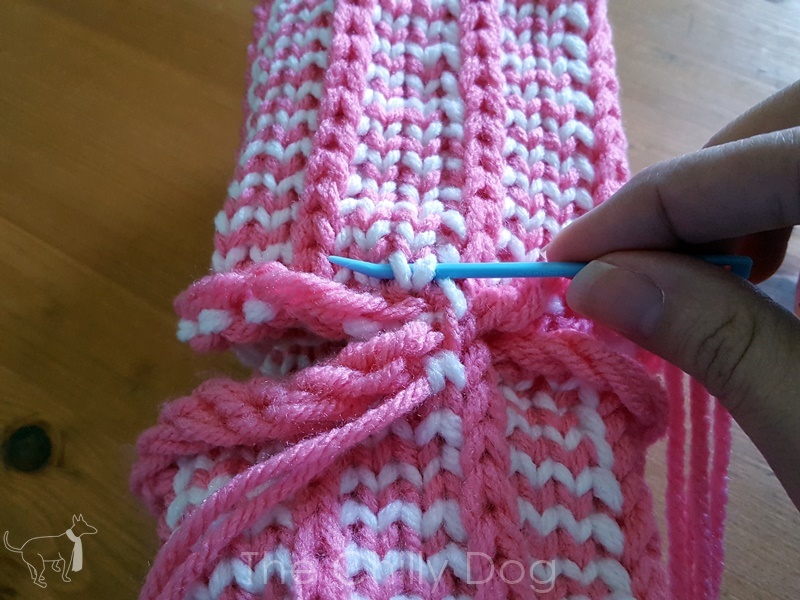 Place the needle under both strands of the first raised Bubble Gum stitch on the cast on edge and gently pull the yarn through. 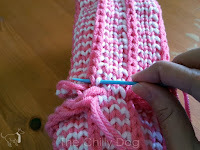 Notice this stitch makes a "V" that points toward the seam. Next, place the needle under the first "V" on the bound off edge. The "V" has one Bubble Gum strand and one White strand. 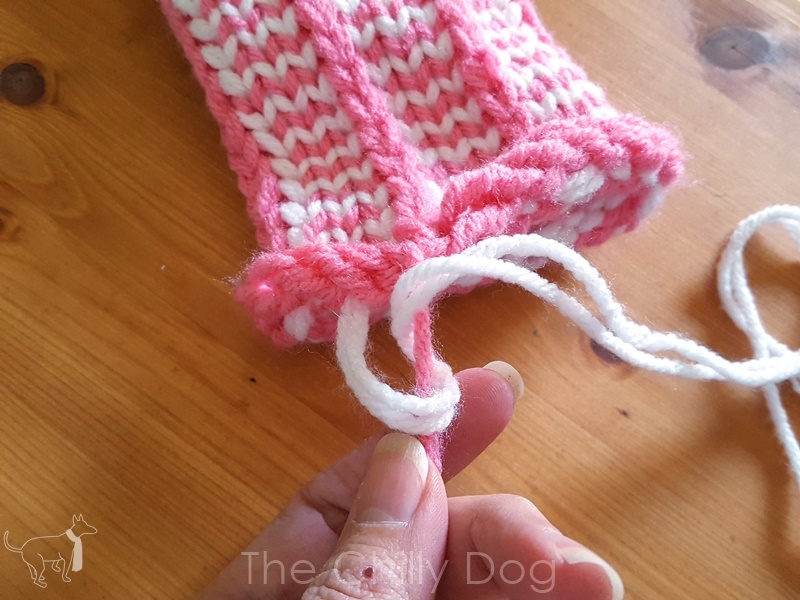 Gently pull the yarn through. 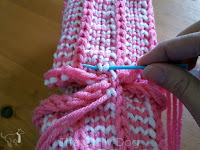 Place the needle under both strands of the next White stitch on the cast on edge and pull the yarn through. Place the needle under both strands of the next White stitch on the bound off edge and pull the yarn through. Continue grafting around the edges of the cowl working one stitch on the bound off edge followed by one on the cast on edge. On the cast on edge, you will always be sliding the needle under stitches where both strands are the same color (White except for the raised Bubble Gum stitches). On the bound off edge, most of the grafted stitches will have two white strands. However, on either side of the ridges, you will work under one Bubble Gum and one White strand. The Bubble Gum strands used for grafting creates what looks like a row of stitches, making the join almost invisible. 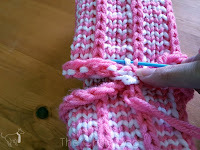 Once you reach the beginning of the grafting, continue working over 2-3 more stitches to make sure the join is secure. Trim the grafting yarn to 6-8 inches and with the darning needle pull it into the center of the cowl to conceal the yarn. Now you have warm ears, a warm neck and we are halfway through our cozy loom knitting patterns. Next up, fingerless gloves. 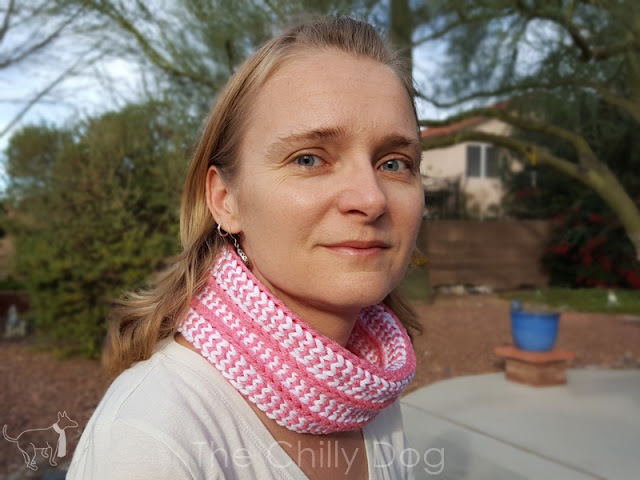 Loom Knit Cowl Pattern: The second of four Clover Oval Standing Knitting Loom projects that will keep you cozy from head to toe.